A while ago I posted my Favorite Jojo characters that excluded Parts 7-8 since I wanted to keep it everything within the more well-known universe. I mentioned that it had been a long time since I read Part 6 and exempted some characters from the list. I have since reread Part 6 and now I feel like an idiot for admitting that I forgot stuff from Part 6 when this particular saga happens to be the most eventful. So for that blunder I made, I think owe Part 6 an apology and its own post to honor it. Fate may have played into this but the 7th of December happens to be its release date so happy 10th birthday to you Stone Ocean. So were he go folks, a “review” that is a decade late, let’s talk about the sixth saga of Jojo’s Bizarre Adventure. In retrospect,Parts 1-6 are ranked as follows: 6 > 4 > 2 /5 > 3 > 1. Let’s start from the bottom here shall we? You can’t really blame anyone from ranking Phantom Blood in the very end. It’s an understandable reason because it’s simply the first, a “prototype”. It has a minimal plotline, little character interaction, silly art, and a generic (but extremely awesome) villain. All in all, if it wasn’t Jojo I probably would have considered this a mediocre entry. The anime however renwed my love for it because the comedic outbursts of exaggerated statements were just so much better when there was a voice behind it. While I am excited to see Stardust Crusaders like many other Jojo fans out there (it is confirmed to air Spring of 2014), I have to say that Part 3 is the weakest of the Stand sagas. Part 3 is like Part 1 when you compare it to the greatness that is Part 2 and so forth. The Stand concept was fresh and new and I think that’s why people forgive it for its shortcomings such as minimal character development. I come between a crossroads between Battle Tendency and Vento Aureo here. Many would prefer the former because of the simple reason of Joseph Joestar and as much as I love Joseph as a character, I think Vento Aureo has something great to offer as well. In exchange for an actually interesting male protagonist, Part 5 upped the volume and intensity of its fight sequences. Everyone probably agrees that Giorno is less interesting and developed as Joseph is but the fight against the Pillar Men weren’t nearly as jaw dropping as Buccellati’s gang fighting the other users. No hate against the Pillar Men though, but you have to admit that Joseph never really had a mano a mano fight against them (then again, they’re superhuman, and no Cars doesn’t count since that wasn’t even a purely physical fight). Diamond is Unbreakable wins my vote because of the laid-back but awesome setting of Morioh and of course my favorite male character Kira Yoshikage. The simplicity of Stands were elevated and more rules were given to Stand Users, Stand Types, and gaining a Stand for oneself. I think I spent a decent time on Part 4 here so let’s move on to the main show. While simply looking up summaries will do the trick, Part 6 contains a lot more than just the regular “prison story”. Much like how Part 4 is spent in the town of Morioh, the majority of Part 6 is spent within Green Dolphin Street Prison. It’s newest inmate is Jolyne Kujo who was tricked by both her attorney and boyfriend to be sent here. Unlike previous Jojo’s, Jolyne recieves her Stand and has the entire length of the manga to develop her strengths. Much like Jonathan and Joseph trained themselves, Jolyne’s development with the simple power of strings proves testament to her abilities when comparing her to the enemies in Part 6. So while Jolyne’s trip to the big house is an eventful trip all together, there’s a much bigger picture that is in the works here. During the days when Dio returned from his watery grave, he befriended a young man by the name of Enrico Pucci. Pucci himself grew up with a rich upbringing with plans in becoming a priest but his sense of justice and love for his family eventually caused a certain innocent man to be murdered. He followed Dio out of interest in obtaining “Heaven” to correct the twisted world. Dio had the ways to achieve heaven but the diary that contained it was burnt at the end of Part 3 following his death. Pucci had dedicated decades into luring Jotaro Kujo to him to extract his memories using his Stand Whitesnake. For this reason, he had instigated everything in Jolyne’s mishap to land her in the prison complex he is employed as a priest for. Pucci is indeed able to retrieve the Stand disk but has signifcant trouble in keeping Jolyne and her friends contained from knowing the truth of his plans. Because Whitesnake can function from far away from Pucci himself, uncovering the Stand’s user is one of the bigger premises to be uncovered. The next “phase” begins when Pucci is able to requisition a Stand user within the complex to bring things back to life. 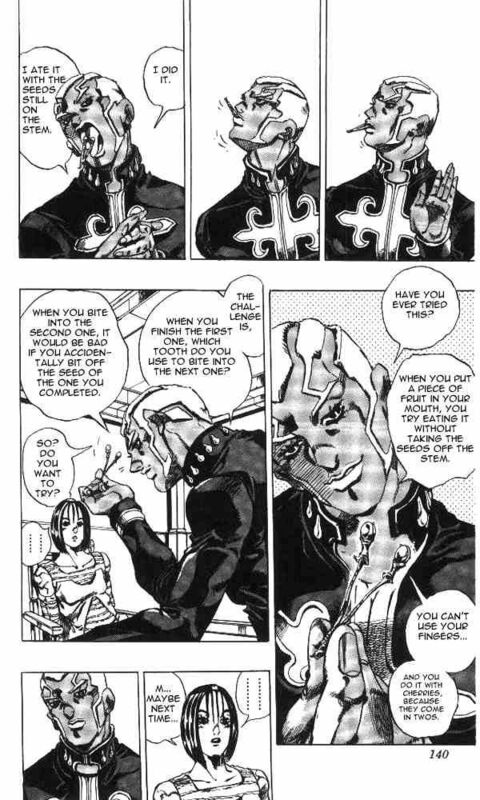 Dio had gifted Pucci his fingerbone before their parting and Pucci recieves a strange infectious new bone after using the Stand’s ability. 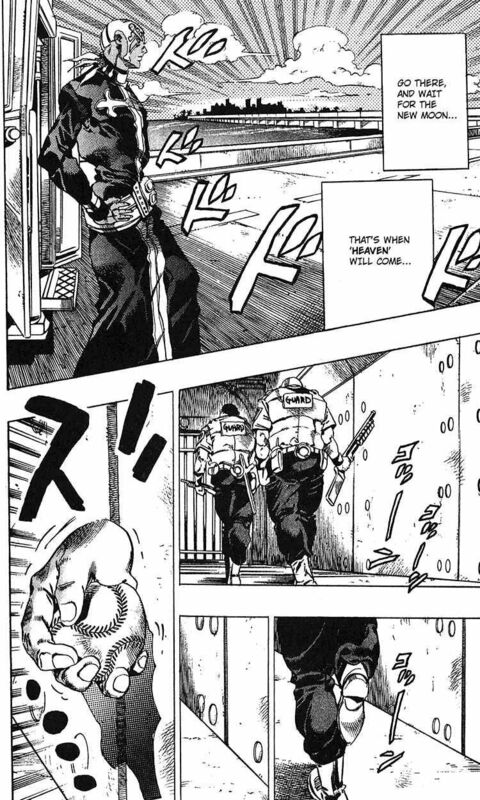 Jolyne would eventually come into contact with the bone and because she was having fights all around the prison, she is sent to the high security area of the prison’s grounds. The infection spreads all over the maximum security levels and Pucci visits and delights to see that the infectious bone has produced a plant with a strange baby inside. After chasing down Jolyne who had escaped with help from her allies, the protagonist crew finally encounter Pucci and learns of his motives. Pucci is able to get himself close to the baby to utter the words Dio had written down and our crew is eventually caught by the prison’s guards. 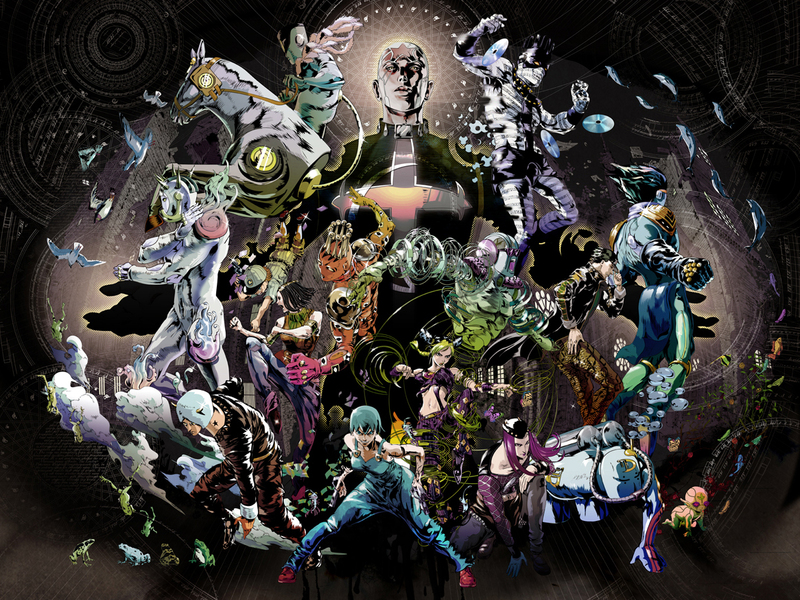 Pucci has now fused with the “Green Baby” and essentially has fused with the “spirit” of Dio and his Stand The World. Following Dio’s post humous orders, Pucci must relocate himself to a certain location by a certain time to finally obtain the power of heaven. Everyone in Jolyne’s crew is locked away but are able to break free to give Pucci chase. I’d go on but I think I’ve done enough. The Prison is essentially where the halfway point begins as the last few fights are extremely long. In terms of actual plot line, the fact that it has one gives it big points. It has the air of mystery in the first half with a dead set goal of stopping Pucci at all costs. The prison complex holds for a bit more development than a constant “move here to there” formula Part 3 and 5 had. That being said, there weren’t too many interactions compared to Part 4 but it works. Part 6 essentially embodies the best of all the parts before it. How can we look through a Jojo arc without any fights? The fight like Parts 4 and 5 have more “utility” based stands so it’s more about working around the powers than actually fighting them fist to fist. While straight up brawls are good sometimes, the creative ability of Stands this time around reach an all-time of of being overpowered. The main thing we have to get down first in terms of fights in Part 6 is that Jolyne has the weakest ability in terms of fighting power. Jolyne has the will power of Jonathan, the resourcefulness of Joseph, Jotaro’s unbending inner strength, Josuke’s kindness, and the Giorno’s near genius knowledge (at least for a 15 year old). Part 6 takes the “longest” in my opinion as well. Part 1 lasted a few weeks minus the growing up time, Part 2 a good month, Part 3 was 40 days, Part 4 around a few months, Part 5 a few weeks, and Part 6 at least felt the longest as you can only imagine how much time goes by when you’re I don’t know, in JAIL. Jolyne has stated that she practiced fighting and even for the hell of it, got a navel piercing while being held in maximum security. Anyawys, getting back to the main point. Jonathan had renowned ripple talent, Joseph was crafty as balls, Jotaro had Star Platinum, Josuke had healing, Giorno and life manipulation, and compared to all that, the power of string seems pretty lame. The surprising thing is, Jolyne probably has the most fist to fist fights than most of the cast. While gimmick fights do exist, Jolyne’s utter use of utility in her strings leave for a lot of physical fights using her extended reach. One of my favorite fights was a legit fist to fist match against Viviano Westwood and Kenzou in the fight against Planet Waves and Dragon’s Dream. 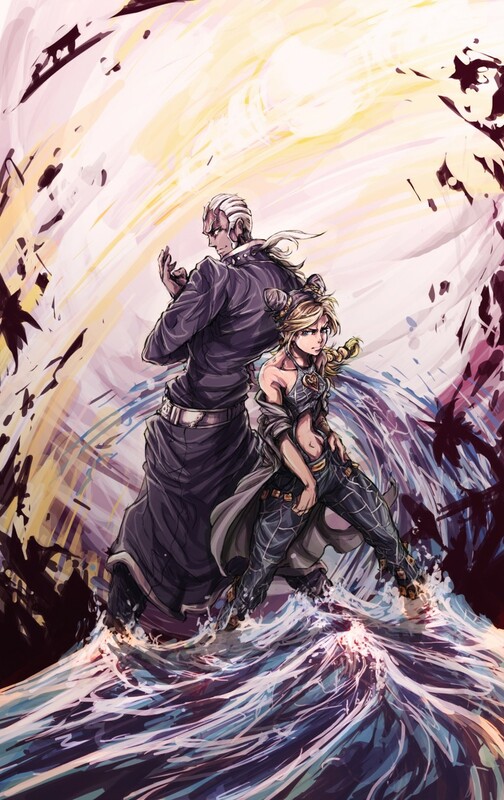 Hell, just getting close to the antagonist’s stand usually meant certain death and that rarely happens until the final blow is about to be dealt, but Jolyne decides to go all in against Pucci’s evolving Stand and eventually the fully realized Stand itself. The fact that she won out against extremely broken Stands with just string shows her how much of a fighter she really is. The companions in Part 6 also happen a bit more closely knit. While not as close and sentimental as the Part 5 gang, the crew in Part 6 feel like a legitimate rag-tag team of weirdos. Hermes is much like Polnareff who is first fueled by revenge but eventually follows Jolyne to defeat Pucci. F.F started out as an enemy but becomes an invaluable ally and becomes the usual healer in the party. Emporior doesn’t really fight but nonetheless remains as the go-to person since he has enough objects at his disposal to warrant some utility. Anasui and Weather Report are the badass duo that are probably the most powerful fighters in the group but both have their odd quirks. No side character stole the show from its Jojo like Buccellati did so Part 6 makes sure that it’s all about Jolyne. I do have to give special mention to Weather Report and his backstory, it’s probably something I wouldn’t have expected if I wasn’t spoiled beforehand. Pucci himself is an extremely developed villain and probably one of the best Jojo has to offer. While I still consider Kira my favorite, Pucci gets more backstory and motives behind him. Kira is simply a serial killer who ironically wishes for a quiet life, Pucci however is far more ambitious. If I had to compare Pucci’s goals with any modern day example people could understand, it would be Tobi/Obito from Naruto. Long story short, Obito goes “I will recreat the world because it wronged me” because his first love (these kids are like teenagers) died. Pucci on the other hand learns of a horrific truth of his family and when his sister commits suicide because of the incident he is responsible for, he is stricken with extreme guilt. His devotion to Dio stems off his willingness to correct the world but instead of doing it purely personal reasons, he is convinced that his goals will bring humanity to happiness. 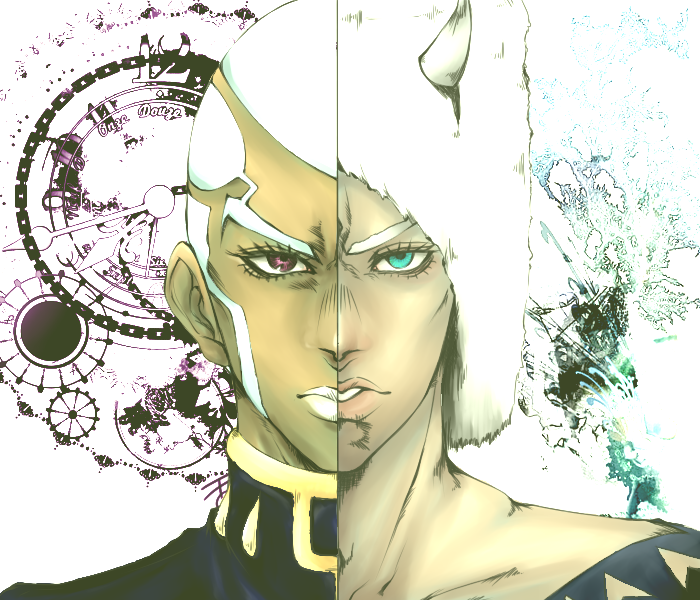 Pucci was twice told by his “nemesis” that he is the worst kind of evil as he does not think he is evil at all. Much like Kira, I enjoyed Pucci’s seperate segments since he’s such a lovable villain in his determination and pure devotion to fulfill his goals. Part 6 also has one of the more controversial endings that has a lot of mixed reactions. I won’t say exactly what happens but the existence of Part 7 and 8 shows that something completely OUTRAGEOUS occurs at the climax of the entire ordeal. While the thought of a female Jojo might put someone off evento this day, Part 6 probably has the most well developed hero and villain schemes while making sure our crew of companions aren’t ignored. The fights are completely off the charts and seeing the basic ability of string prove triumphant against Stands that call down meteors, bring fictional things to life, allow you to remember only 3 things, and even more insane abilities, it tells something or two about Jolyne’s skill and resolve. That’s all for today folks, allow me to get some more pieces done. 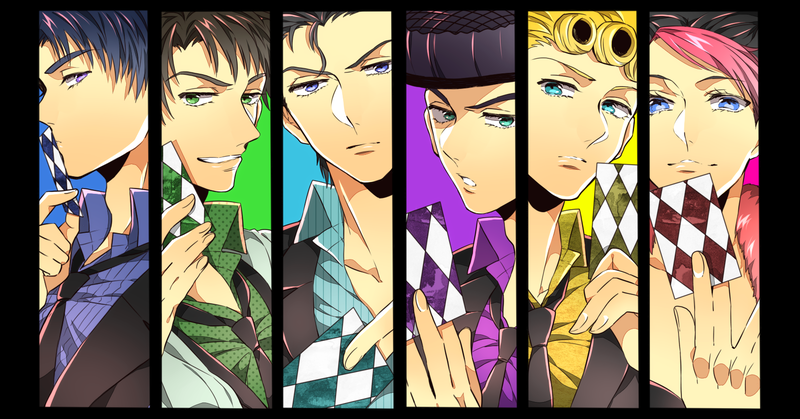 I might even talk about Part 7 if I feel up to it since that is on a whole different level.